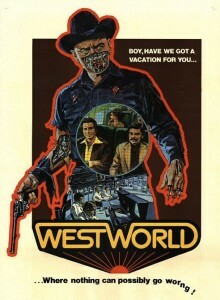 Written and directed by the great (and unfortunately late) Michael Crichton, Westworld remains one of the true classics that defined the sci-fi movement of the 70’s, where social concerns were becoming evident in a more sophisticated storytelling. Its wildly original setting (at least at the time) of a theme park populated by robots where things go awfully awry is widely recognized by now, even by people that never actually saw the movie. While it hasn’t necessarily aged very well (there’s plenty of corny acting and filler scenes galore), it’s still a distinct example of the type of sci-fi that was being made three decades ago. It was also a hugely popular film, and it must be admitted that the overall premise is excellent, in the same way that, say, Logan’s Run was a popular film without necessarily being a great one. One truly amazing thing that Westworld has definitely going for it is the superb villain (played by Yul Brynner of The Magnificent Seven fame) that is scarier than the Terminator itself. Yes, really — you’re not only convinced by his representation of a robot gunslinger but he also manages to scare the living crap out of you. Add to that the fact that he predates Terminator by over a decade, and you get more than enough reasons to include Westworld in the hall of fame. If anything, the movie is one hell of a fun ride. Dude! Yul Brinner! I wonder how I managed to skip this one. Thanks for bringing it to my attention!